YUM! Delicious! My only complain is I wish I had made two pizzas instead of one! Enjoy! Par-bake the plain pizza crust for five minutes or so to ensure it is crispy after you have baked it with toppings on. I'm not giving any specific measurements because this is a pizza and it's hard to mess it up! So just put on as much or as little as you like - it'll all taste good. Put a tiny bit of olive oil on the par-baked crust (like 1/2 tsp) and spread it evenly over the crust. If you like put a little bit of good quality sea salt on top (and by a little, I mean a pinch and by good quality salt I mean Himalayan or sea salt..... you still aren't using table salt are you? Oh I hope not! Yuck!). Evenly distribute mozzarella cheese over crust, then blue cheese (maybe like 1/4 cup of blue cheese or more if you like the flavor). Place apple slices on top of the cheese and then sprinkle on walnuts. Bake in the oven for about 8 - 12 minutes - just check on it....when it's done you'll know. 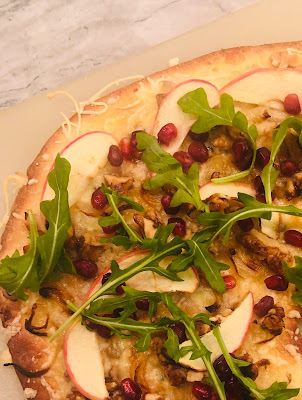 Sprinkle pomegranate seeds and fresh arugula on top (I literally cover my pizza with arugula like it's an entire salad!) and drizzle with balsamic glaze. Enjoy!! 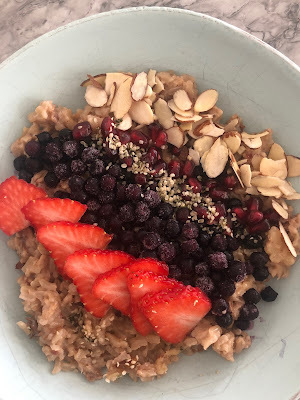 I made this delicious coconut milk and brown rice pudding (and it really does taste like dessert!) the other day when my mother in law was out visiting. Oh boy did she like it! I had some leftover rice in the fridge and decided whip this up like a warn oatmeal. Control how sweet you like it by adding more or less maple syrup.....and then go crazy with the toppings! I put strawberries, blueberries, fresh pomegranate seeds, hemp seeds and almonds on mine. It was very filling and satisfying. This makes enough for about 3 servings. Place cooked brown rice and coconut milk in a medium saucepan over low-medium heat. Stir. Add maple syrup, chopped dates, cinnamon, vanilla and salt. Let mixture come to a low boil, stirring constantly. Stir on this low-medium heat for about 10 minutes until the rice starts to stick to the pan and mixture has thickened. Remove pan from heat. Stir in the oats and walnuts. Spoon pudding into bowls and top fruit, seeds and nuts. Enjoy!! I absolutely love this granola! It is gluten free and sugar free, yet it has nothing but flavor! It only has four ingredients (optional five) and all you need is a food processor. 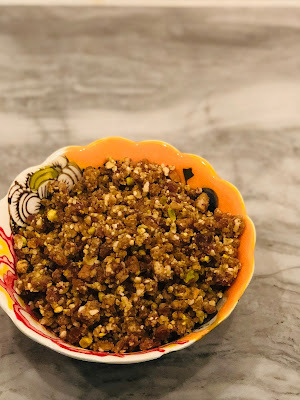 It was inspired to copycat a granola served at one of my favorite local organic restaurants. I love having this granola on hand to sprinkle on yogurt parfaits. 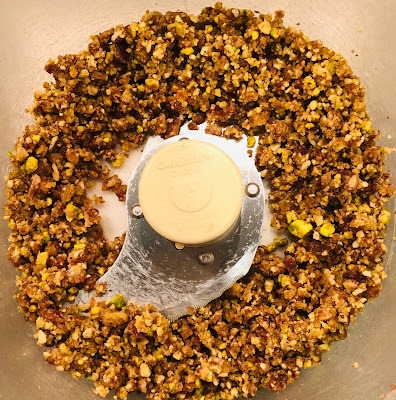 When you are making it be sure to ONLY pulse it - do not hit "on" on your food processor and let it ride.....it'll turn into paste and that is not the consistency you are looking for. It should be crumbly. It takes about a minute or two of hitting the pulse button on and off before getting the desired texture. Using cold dates helps them to keep the texture better when pulsing. 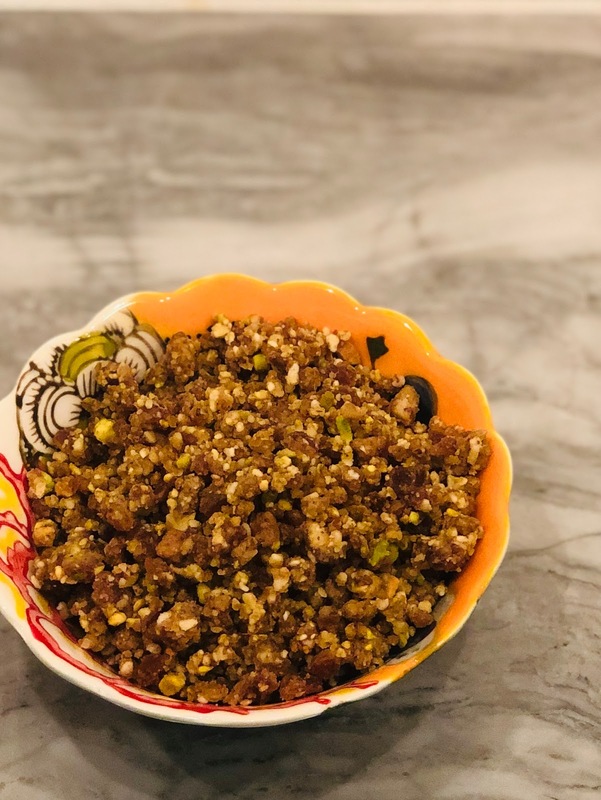 This granola is full of fiber, healthy fats like Omega 3s, protein, antioxidants, magnesium, potassium, iron and vitamins E. And honestly, it just tastes delicious! Place all ingredients in a food processor. Pulse on and off until granola is desired consistency - which is little, even sized "crumbles". Store in the fridge for up to two weeks. This makes about 1 1/2 cups of granola. These cookies were a BIG hit with everyone today! 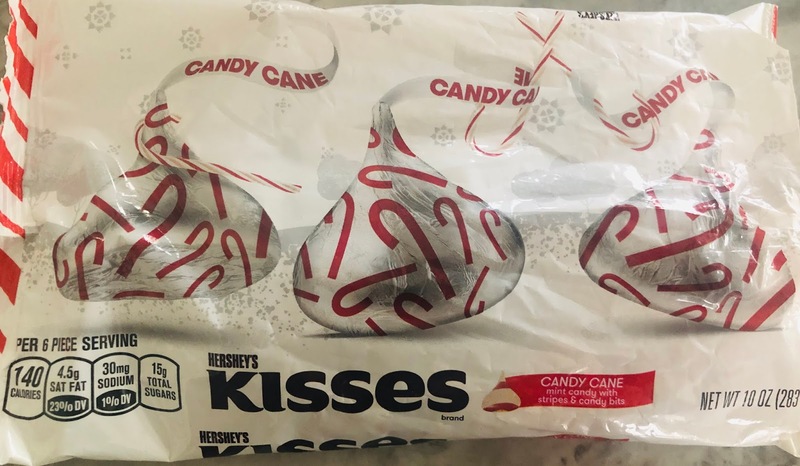 I used a little bit less sugar than I normally would when making cookies because the candy kisses and candy canes add quite a bit of sweetness. I'm really happy with how they turned out and all three kids said, "You need to blog these, Mom!" So, here ya go! These are perfect cookies for the holidays!! Stir softened butter and sugar together; add egg and stir. Add vanilla and stir. Add salt, 1/2 cup flour and baking soda; stir together. Add remaining 1/2 cup of flour. 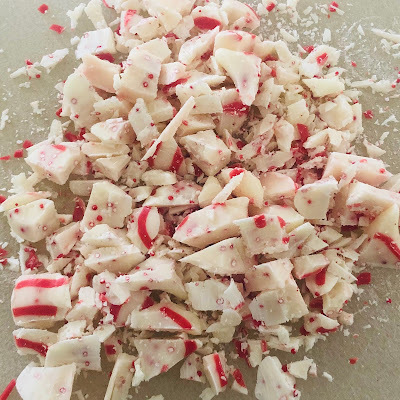 Add the chopped Candy Cane Kisses, crushed candy canes and 1/4 cup mini chocolate chips to the dough and fold in. Place dough in the refrigerator for at least two hours (up to overnight) before baking (I promise you there is an actual science to the why chilled cookies bake/taste better - go ahead and google it!). Lightly grease a cookie sheet with butter - I don't usually do this but the melted candy canes have a tendency to stick to the cookie sheet - greasing it makes them come of the pan more easily. Trust me! Bake at 350F for 8-10 minutes. Let cool for 5-10 minutes before transferring them to a plate. Enjoy! 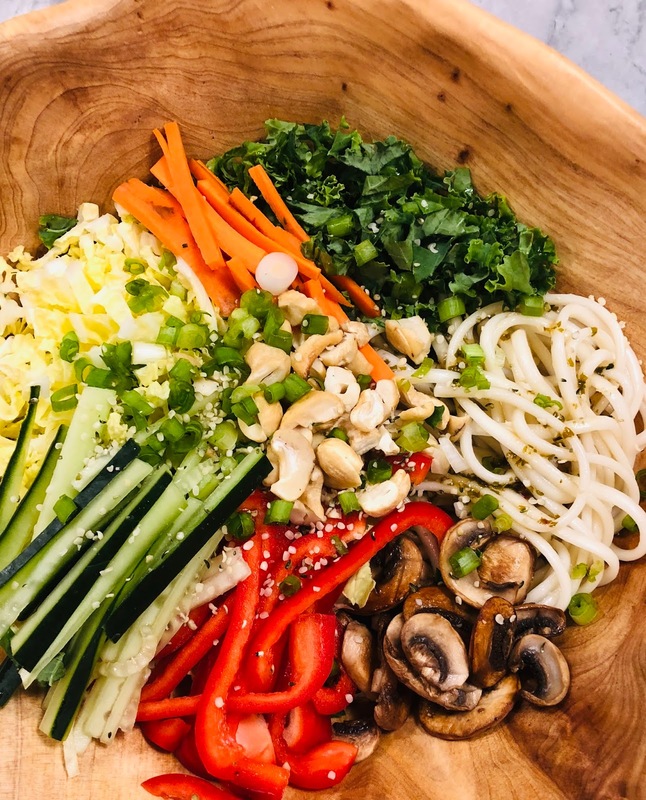 LOVE the way this Udon Noodle Bowl turned out! It was scrumptious! My kids were mad I didn't give them bigger portions. Next time I'll make more! I would saw this makes enough for three large size portions, so if you have a big family, you may want to double it. 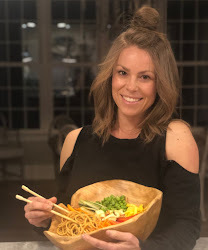 I added baked tofu to my family's meal (I offered chicken to my husband and he opted for the tofu), but I think shredded chicken or even thinly sliced flank steak would be amazing on this Asian inspired salad! Enjoy! pinch of crushed chilies, or more if you like it spicy! Cook the Udon noodles according to the directions on the package. After draining, rinse them well with cold water, use your hands to "fluff" the noodles as you rinse - this helps them from sticking together. After they are rinsed and all the excess water has been shaken off, drizzle with 1 tsp to 1 Tbl of sesame oil - this is for flavor and to prevent sticking. Set the noodles aside until you are ready to assemble the salad. To make the dressing place all the ingredients in a food processor and blend until smooth. Taste and add more honey for sweetness, chilies for spice, salt for flavor, lime for tangy-ness.....always taste and add until it is to your liking. Cooking is not a science - it's all about taste. Set aside. Add a bit of olive oil to a pan and heat over medium heat. Add the sliced mushrooms and saute for 6 minutes without touching them - let them caramelize in the pan. Then go ahead and stir them and cook for a bit longer until they are to your desired done-ness. Thinly slice all the veggies - kale, Napa cabbage (definitely use Napa cabbage in this recipe - amazing!! ), cucumbers, carrot, and red bell pepper. If you want to assemble the salad in a pretty way like the picture above, just layer the ingredients. 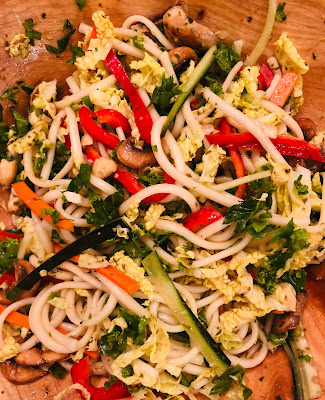 Put the noodles down first, then the kale and cabbage. 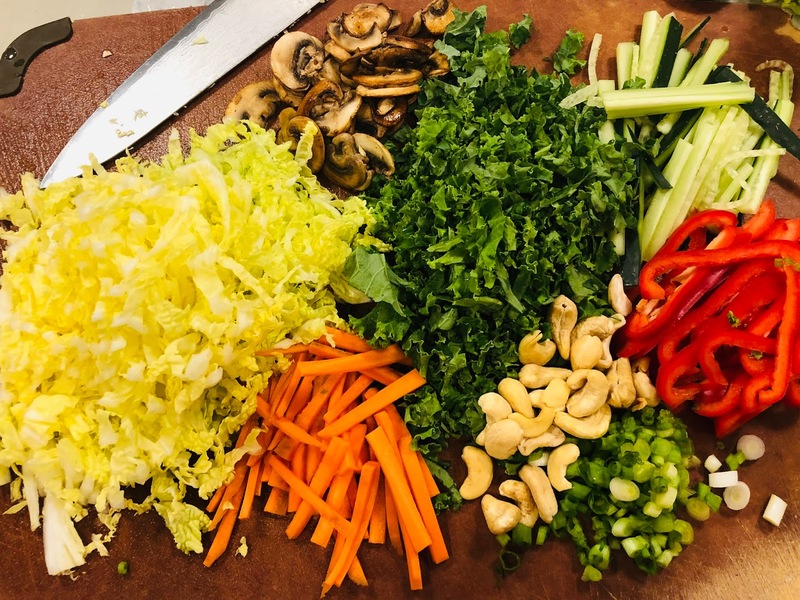 Add the other sliced veggies and mushrooms in a pretty pattern - alternating colors. 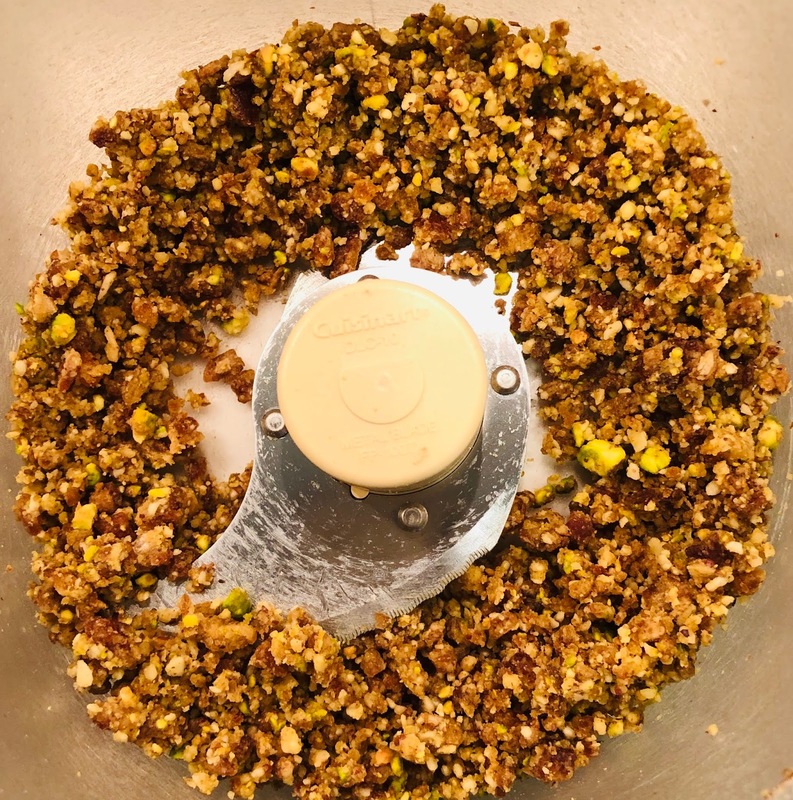 Place chopped nuts in the middle, along with mint and your protein, if using. Sprinkle green onions on top. Sprinkle hemp seed if using (sesame seeds would be nice, too). Drizzle the salad with dressing. Enjoy! 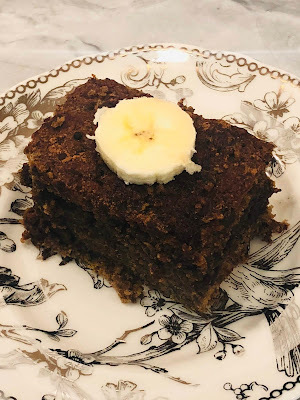 Here I go again - ANOTHER banana bread recipe. I can't stop! I make a batch every week so the kids have a quick breakfast in the morning. 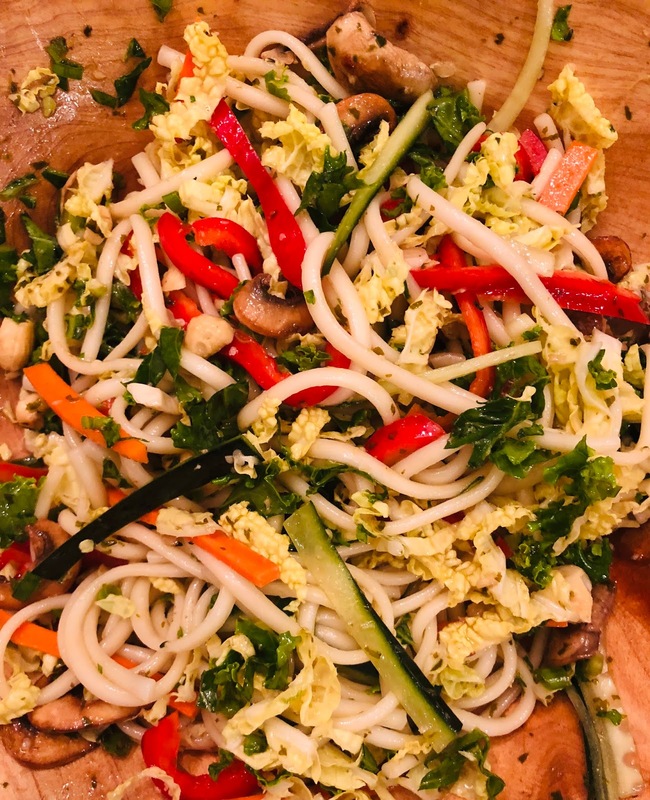 I get bored making the same recipes over and over again - so I thought I would try something new - and with a little more spice! This one is inspired by chai tea. It has cardamon, cinnamon, ginger and cloves in it. I usually add yogurt in my bread to keep it moist, but this time I thought I would try canned coconut milk. The whole thing came together very nicely!! I had to share! This recipe gets its sweetness from the very ripe bananas and organic coconut sugar. 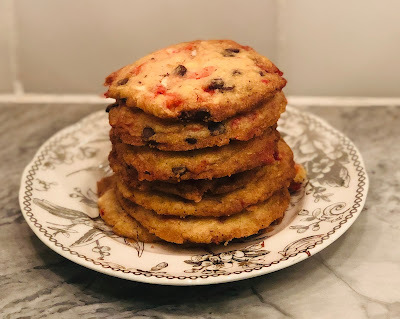 The chocolate chips are optional if you want to really cut back on the sugar (my kids love the chocolate chips, but if I were making this for myself I would use chopped walnuts instead). In a large bowl, mash the bananas using a potato masher. Stir in the coconut sugar and melted coconut oil. Add the eggs, one at a time. Stir in the coconut milk (when you open the can there will be separation - since you are only using 1/2 cup in this recipe and there are approx 2 cups in the can, you'll need to make sure you get a little of the sold cream and the watery liquid- I did about half and half). Add in the vanilla. In a separate bowl combine all the spices, whole wheat pastry flour, flaxseed, soda and salt. Add the dry ingredients to the wet. Combine. Fold in the chocolate chips or walnuts, if using. I use a glass 8X8 square dish to bake. I grease it with a thin layer of coconut oil to prevent sticking. Please take note, if you are using a metal 8X8 dish you will need to bake your bread for a longer length of time. Transfer the batter to a greased glass baking dish, use the back of your spoon to spread the batter evenly. Stir the optional 1 tsp cinnamon and optional 2 tsp coconut sugar together. Evenly sprinkle this mixture on top of the bread. Bake for 28-30 minutes or until a toothpick inserted into the center comes out clean. Remove from the oven and let sit for about 30 minutes before slicing. Enjoy!! Oh my gosh this salad was SOOO delicious! I think it'll be a new go-to for me! I had a similar salad last week at a favorite cafe of mine - it inspired me to try to replicate it at home. I also made the dressing from scratch - I did a Caesar, but instead of mayo based, I used plain Greek yogurt. Healthy, delicious, filling, fresh, flavorful - I think this salad has it all! This is great as a side salad or add sliced chicken or a piece of salmon and eat it as a meal. I served ours alongside a plate of gnocchi. Line a baking sheet with parchment paper. Lay broccoli florets on baking sheet and drizzle with 1 Tbl olive oil. Sprinkle with salt and pepper. Use your hands to toss and then spread broccoli evenly on baking sheet. Roast for about 18 minutes, or to your liking. Let cool slightly. While the broccoli is roasting make the salad dressing. Pour 1 (or 2) tablespoons of olive oil into a skillet on medium low. Place to the cloves of garlic into the skillet and let slightly sizzle in the oil for about three minutes on each side. The garlic should be slightly browned on the outside and soft on the inside. I always saute my garlic like this before adding it to dressings. Cooking it just a bit really brings out a mild, delicious flavor - and it cuts down that sharp raw garlic spicy-ness. Remove the garlic from olive and chop. Save the infused olive oil for the dressing. Place the garlic, garlic infused olive oil, Dijon, lemon juice, Worcestershire sauce, Greek yogurt and milk into a container. Use a fork to combine completely. If it's too thick add a splash more milk or lemon juice. Add salt and pepper to taste. 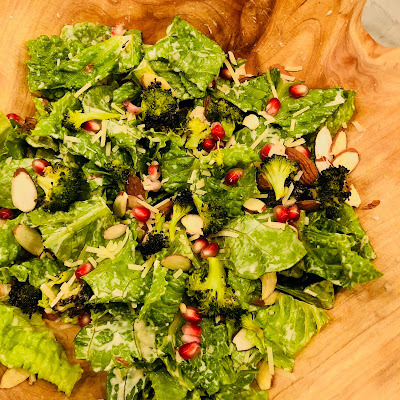 Combine chopped romaine, roasted broccoli, Parmesan, pomegranate seeds and almonds. Drizzle with salad dressing. Toss. Enjoy!! !